This entry was posted by quilly on Thursday, August 20th, 2009 at 10:43 pm	and is filed under nature, Paid Post, Photograph, SS, weather. You can follow any responses to this entry through the RSS 2.0 feed. Both comments and pings are currently closed. That’s a wonderful shot. Maple trees do have the most beautiful leaves in the summer and then also in the fall when it’s like they are on fire. The greens are more interesting then the blue sky ! If you love green as a color, you should go to England. I have never seen so many green shades in my whole life as a painter ! they are uncountable. The grass looks greener, the trees have different green shades the bushes again too. It was just amazing. Green is not my favourite color, but I started to like it ! I have never seen a maple tree. Those leaves are beautiful and so is your photo. Carver — welcome! I haven’t seen you since our photo challenge days. I agree with your Maple leaves in fall comment, unfortunately we won’t be in Washington State this fall to watch this one turn, and such things don’t happen here in Hawaii. Gattina — I would love to visit England someday. Nicole — maybe someday you will see a Maple tree up close and personal. You travel a lot, so the possibility is there. I love the green but it would be wonderful to see the changing folliage in the Fall. I love the way the sky creeping through the leaves! Quilly: What a neat look at the sky through the Maple leaves. This lighting through the leaves is so very beautiful! The whole image would make a great design on a piece of material! I love that shot! You photo feels both warm and cool. I hope that you have a lovely weekend in the shade! Ebie — I do miss seeing the changing seasons. Well, except for Winter. I’m not too fond of slush and ice and dirty snow. Fishing Guy — I’m glad you liked it. Gemma — oh, wow. Wouldn’t it though? Kind of a batik effect would be cool. Jennifer — alas, I am many thousands of miles away from that shade, and here staying cool has been difficult. 90 degrees F at 90% humidity makes for a steam bath. This is a fabulous photo, it feel like summer to me. Pearl =– hmm, something about your name made me think you’d like this photo! 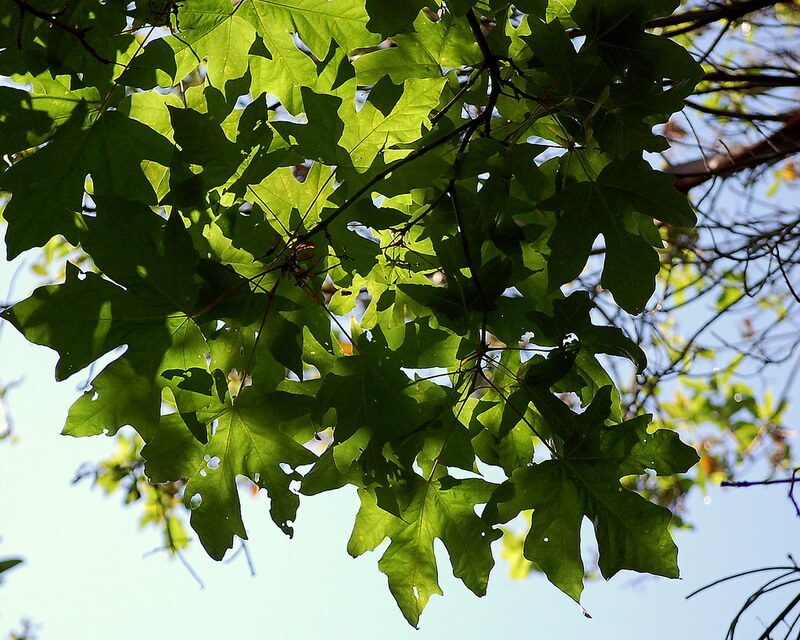 Hi Quilly, I, too, love Maple trees – so green and shady in summer and so beautiful in fall. My friend was just in the San Juans for a wedding – she loved it there. The San Juans are a beautiful place to visit. I like the lighting in this photo.